Four core members of a local urban art group chat with MB about everything from inspiration and Instagram to how they met and the message they hope to send to society. The room was dimly lit, the tables bustling with local patrons, and a thick aroma of delicious food greeted me as I opened the door. This was my first time venturing into Kazoola Eatery and Entertainment on Dauphin Street, where I would soon be chatting with four of the most talented and ambitious cultural artists in the Mobile community. 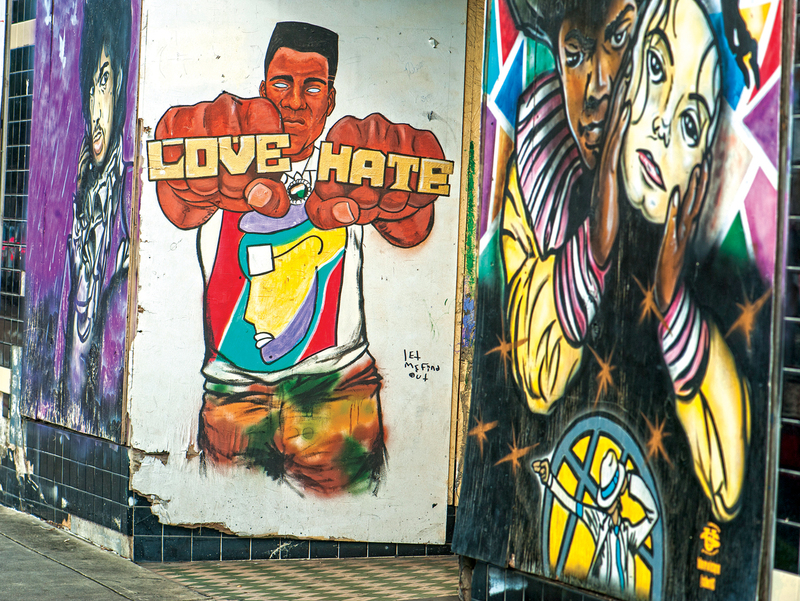 Visual artist DeAnthony Dulaney — founder and leader of the Red Cup Revolt movement — ignited an inspiring conversation that would challenge the standard perception of graffiti artists and their connections to the human spirit and local community. His fellow artists were thrilled to join in and offer their profound insights as well. Now it’s your turn to meet DeAnthony, Brandin, Conzi and Michael or — as they are better known in the art community and with each other — DIPLOMAT, Stallworth, conz8000 and Deedz. MB: You guys formed your own group as artists. Are making connections with other artists important for your craft? Deedz: I had been doing stencil art until around 15 years old. I went to New Orleans one weekend and seeing it again really took me back. When I returned [to Mobile], I got back into it seriously, and I’ve been doing it ever since. When you see another artist’s work [like on Instagram], and it’s incredible, then it really inspires you. Honestly, Red Cup might not have even happened without seeing other people’s work on Instagram. That’s the awesome thing about art. My passion has never been stronger than it is right now, having met these guys and gotten into this group. Mobile doesn’t have many platforms for art. But, no matter who you are or where you’ve come from, everyone has had a red cup — a Solo cup — in their hand, partying and just being together with other people. DIPLOMAT: Connections are key. I didn’t realize it back then, but my tattoo apprenticeship was actually around the corner from Stallworth’s studio. That’s where we ended up having our first Red Cup meeting. There were about 10 artists in the group at first, but that all dwindled down to the main four. When I left the tattoo shop and went to Stallworth’s and saw all his artwork and fashion, it was inspiring. I hadn’t done anything like that in a while. I used to do shirts and canvases in high school. MB: Tell us a little about Stallworth Studios. Stallworth: Oh, it was just my house and garage. (Group laughter.) But yeah, I started out painting T-shirts. It really took off. We did shirts for various groups, social clubs, fraternities and all kinds of stuff. When I moved to Atlanta, I was living in a house with my cousin, doing music at the time. I took on some hip-hop projects. One day my cousin saw I was drawing on a digital tablet. He was like, “Yo, you draw on a screen?” I was like, “Yeah! It’s 2012! What’re you talking about?” He said, “No, man. That’s not the way to go.” And he got me back into drawing the real way. Period. I realized I had just bought the tablet because I had some money. But when I realized the kind of true art he was doing in Atlanta, that’s when I started really taking it seriously. 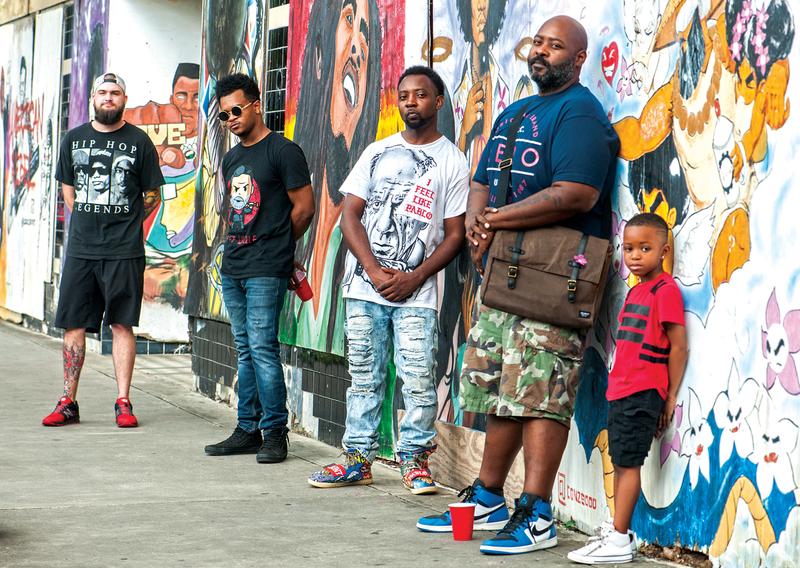 Pop culture icons and murals painted by the men of Red Cup Revolt line the streets of downtown Mobile. MB: What has the response to your work been like at the local art walks and events? DIPLOMAT: Overall, the response has been good for real. MB: Where do you all draw your inspiration from as individual artists? Stallworth: Energy, like from what I see in the culture and around me. Deedz: Instagram. I pop on there and see stuff [by other artists]. Then I go to my art room and start messing around. conz8000: Life experiences. The same things don’t inspire me all the time. Sometimes it might be what’s happening in the news, other times it could be my mom. I just want to contribute to creation. DIPLOMAT: Energy for me, too. Also, getting on Instagram, keeping an eye on what’s happening in the culture. I’m also big on pop art and I like to do things that people will recognize. I want to leave my mark so that people will remember I was here. MB: If you were to go viral as a group at the national level, what would be the message you would want to send to the culture, particularly the younger generation? Stallworth: Just to be inspired. You can do this. Deedz: Hate is baggage. Life is too short to hate. If everyone would understand this, life would just be so much better for everyone. conz8000: We got to coexist together. DIPLOMAT: Chill out. Take time to meet your neighbor. Learn about them. We all have things in common, whether you’re black, white, gay, straight, Alabama fan or Auburn fan. We want people to see that if you just pick up a red cup and put something in it, no matter what it is, and chill out and talk with other people, everything will be okay. We’re all in the same boat, and if it sinks, we’re all going down together.